At 03:02 EVE Time, Roushzar, a system in the Devoid region, was liberated by 24th Imperial Crusade forces. On the face of it, the system seems a blip on the radar. DOTLAN shows that while some fighting did occur in the last few hours before the system flipped, it was nothing like the conflagration that has characterized Huola. In most respects, the system seems rather insignificant, except in one important aspect: The system is one jump away from Huola itself. A number of Amarrian pilots recognized the strategic value of Roushzar early in the Burn Huola campaign. Credited by many for ninja plexing Roushzar at least to the mid-70 percent range, these pilots included–but are not necessarily limited to–Christine Peeveepeeski of The Amarrian Commandos’s Imperial Fedaykin [TMFED], Thorin Matarielle of Shirak Skunkworks [SWKS], and Bienator II of madmen of the skies [YMAD]. FactionWarfare.com reached out to Bienator II to obtain his thoughts on the liberation of Roushzar, and the wider Burn Huola campaign. With the aforementioned pilots plexing the system up to the mid-70 percent range, pilots in Amarrian Vengeance [AVNG] and WINMATAR. [WMTR] were impressed with the effort and decided to divert their full attention to Roushzar. Over an 18-hour period spanning most of July 17 and including the early hours of July 18, Amarrian pilots ground out the plexes, braving Minmatar resistance. Interestingly, that resistance was very light during the actual I-HUB bash. Led by WINMATAR. Biohazard [-BIO-] Dog0fWarr, the WINMATAR. fleet deployed Vexor Navy Issues and Ishtars, which supplemented additional militia forces that included attack battlecruisers and stealth bombers. I Whip My Slaves Back and Forth [J4LP] provided coverage in the plexes as the bash went on, utilizing Federation Navy and Police Pursuit Comets with logistics frigates to hold the plexes against token Minmatar resistance. Indeed, the resistance was so light, that a mystery 24th Imperial Crusade pilot jumped an Archon in for the bash, safely extracting after the system had been flipped. 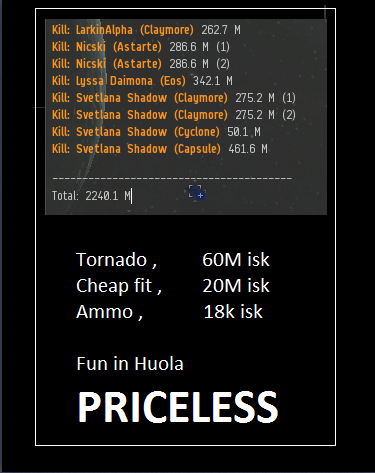 Although Minmatar sources could not be reached at the time this article was written, through the local smack talk and propaganda in the forums, many pilots of both sides are in agreement that Burn Huola has resulted in some of the best pvp to reach the Amarr-Minmatar warzone in years. The only reason we are not available is because you a) never actually tried to reach us and b) you guys have been shitting up Huola local for 2 weeks now so most of our people have the whole Winmatar alliance blocked. I assure you that I made an attempt to contact Minmatar leadership, giving ample time for response. I suppose, however, that you could assert that I failed to do so if I had been blocked by virtue of guilt by association reasoning. Regardless, I am more than open to producing balanced articles. Niluso is one such Minmatar pilot who actually contacted me, providing me information on the cruiser fight in Huola a couple weeks ago. Thus, if I may make a suggestion, if you would be so kind as to provide me a list on public relations contacts in-game so that I might possess some resources? Clearly, my methods of making requests fall on deaf ears, then I am accused of not making attempts to contact them. Even to the most studious and capable of journalists, that barrier is incredibly difficult to overcome. I am more than happy to provide Minmatar coverage, but I cannot do so if the Minmatar remain reluctant to give me information. If you have people blocked how do you expect them to actually reach you, give you a rl phone call? Nomad pls, if you want the minnie side to be covered better unblock or attempt to contact Mr.Sakakibara. Also, this site was conceived as an info-web not a propaganda-web, just saying cos u sounded like u are making an accusation against one of the prominent writer here. Also, you need a slaver, to enlighten you and what-not. peace bro o7. So , now want us to believe that huola was just a diversion … seriously ?